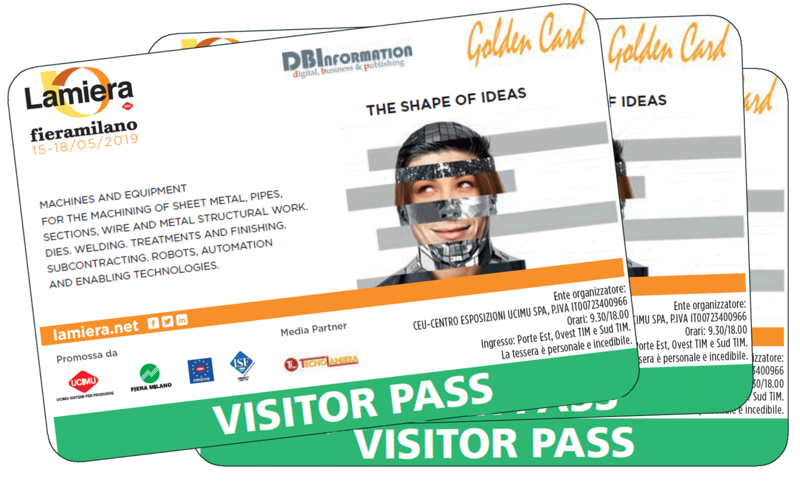 It is possible, up to 18th May, to pre-register online and receive the Golden card, which offers free admission to LAMIERA, as well as numerous advantages and special rates available on www.golden-card.it for all operators. You can pre-register and obtain your Golden Card immediately, directly at your e-mail address. Besides permanent, free admission to LAMIERA, your Golden Card offers you several discounts and special rates at “partner” hotels, restaurants and shops, specified in the list www.golden-card.it. Moreover, this year, thanks to the agreement with Gruppo MilanoCard, Golden Card holders can buy special MilanoCards created to give unlimited access to public transport, including the Rho-Fiera connections (twice a day), as well as discounts and special conditions for restaurants, services and admission tickets to museums and monuments. There are two versions of MilanoCard for Golden Card holders: prices and details will soon be available on www.golden-card.it. Thanks to the on-line pre-registration it is possible to receive the entrance ticket free of charge. The entrance ticket can be bought also at the LAMIERA receptions during the exhibition. Daily ticket 12.00 €. Minors: up to 3 years old the visit is not recommended; children can enter free of charge only upon request of the parents and under their full responsibility. Minors from 4 to 17 years: can enter for free (complimentary ticket) only if accompanied. Schools: online pre-registration from 18 March to 18 April. Following the new safety regulations issued by the Authorities, metal detectors and scanners have been installed at South TIM, East and West TIM gates, which quickly guarantee checks on people and luggage. – It is forbidden to introduce explosives or explosive materials, weapons of any kind and relative ammunition, objects suitable for wounding (art.4 L.110 / 1975). Would you like to visit LAMIERA? Do you want help to better organize your visit to LAMIERA? Contact the organizational secretariat. Your every question will be answered quickly. This site uses technical cookies to allow better browsing and non-technical cookies for the use of which your consent is required. If you want to learn more click here. Consent may be expressed also continuing the navigation.